Mivos got an excellent review in the New York Times for our October 13 concert, which featured works by Lachenmann, Cage, and Rihm. You can see the review on the NYT website here, full text below. Thanks to all who came out to see the show! One of the real challenges for a composer today is finding a way to structure a piece so that it comes across with a compelling dramatic arc. Things were a little easier back in the days when sonata form, rondo and other such genres were common, though in reality those classical forms provided little more than general layouts. Today it is not enough for composers to have vivid imaginations and distinctive musical languages. They must channel their ideas into some structure that is often unique to a particular piece. An ingenious example is the composer Helmut Lachenmann’s String Quartet No. 3 (“Grido,” 2002), which received an accomplished and absorbing performance from the Mivos Quartet on Saturday night at the DiMenna Center for Classical Music on West 37th Street. This was the concluding work on a thoughtful program that included Wolfgang Rihm’s “Quartettstudie” (2004) andJohn Cage’s String Quartet in Four Parts (1950). Mr. Lachenmann, 76, a major German modernist, has been gaining champions among younger American performers and ensembles in recent years. In 2010 he visited New York to take part in a concert of his works at the Miller Theater, part of the Composer Portraits series. The most striking quality of his music comes from the unconventional sounds he draws from instruments. The Italian word “grido” means shout or cry, and Mr. Lachenmann’s Third Quartet certainly cries out, though mostly in hushed and mysterious ways. Through whole stretches of this 25-minute single-movement score the players produce strangely beautiful sounds — scratches, tappings, grumbles, squeaky hinge creaks — by applying the bow to all parts of their instruments. There are all manner of tremolo effects and eerie harmonics. Who needs electronics when a string quartet can produce such wonderful noises? Yet for me the real achievement of the piece is its structure. Out of a vocabulary of plinks, plunks and ethereal sonorities, Mr. Lachenmann has built a piece of sweeping narrative power. It begins with high scratching sounds and chords that blur tonal and atonal harmonies, yet sound uncannily precise. During some episodes the instruments slither around as if in a contrapuntal free-for-all, or break into frenetic busyness, or bring time to a standstill through hazy, hovering chords. It was actually difficult to discern the overall structure of the piece while hearing it. But it came across as a monumental entity. I was hooked by the music and the brilliant performance, as was the audience, which whooped and applauded at the end. The Mivos Quartet, a New York ensemble founded in 2008 that focuses in contemporary music, also excelled in Mr. Rihm’s “Quartettstudie,” which combines modernist techniques with a post-Romantic sensibility as it moves through nine minutes of fitful, unpredictable music. The components of Cage’s Quartet in Four Parts, a 20-minute piece that explores stillness and quietude, come from a set pool of short motifs, sonorities and modal-sounding chords that appear repeatedly. In their performance the sensitive Mivos players created the contemplative atmosphere this piece demands. It helped that the concert took place in the DiMenna Center’s cozy, wood-paneled Benzaquen Hall, with chairs set up for just 50 people. 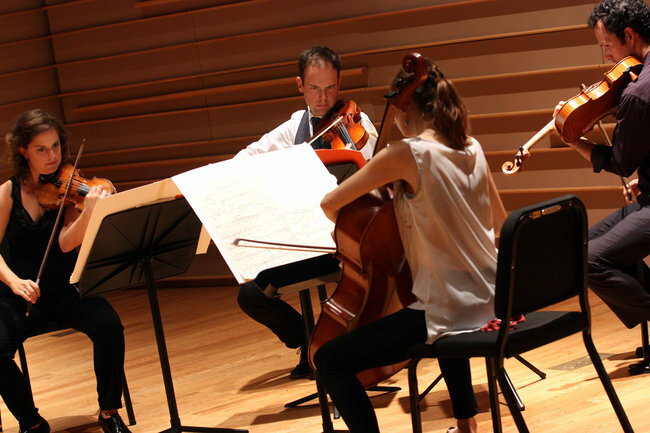 ← Mivos Quartet Concert Tonight, 10/13!